In this article, we will briefly consider the importance of a healthy lifestyle if you want to reduce the risk of lifestyle related disease in your life. I assume anyone visiting this site would be wanting to do this. So, what if we eat too much, drink too much and don’t get enough exercise? The scary thing is that statistics tell us that one in five people will die of lifestyle related disease. 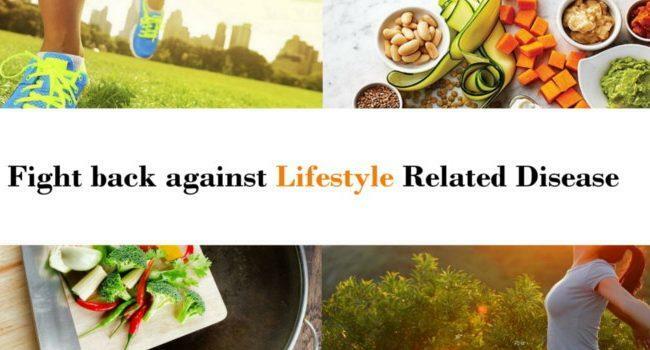 Lifestyle related disease is defined as disease linked with the way people live their life. You know, when they eat too much, drink too much and don’t get enough exercise, as well as other bad lifestyle choices. Diseases which are caused by a lack of physical activity and unhealthy eating as well as alcohol, drug and smoking. Disease including heart disease, stroke, cancer, type 2 diabetes, obesity, and arthritis—are among the most common, costly, and preventable of all health problems. The good news is that most lifestyle related disease can be prevented by changing risk-related behaviors. In fact tens of thousands of lives can be saved, by making lifestyle changes. Let me give you an example. In a study at the Institute of Health Metrics and Evaluation at the University of Washington it is said that poor diet is a factor in one in five deaths around the world. Here in the UK Public Health England has put the costs of dealing with obesity at over £4bn. Simon Stevens, NHS England chief executive said “a slow-motion car crash in terms of avoidable illness and rising health care costs”. According to the World Health Organization WHO, 60% of related factors to individual health and quality of life are correlated to lifestyle. Millions of people follow an unhealthy lifestyle. Hence, they encounter illness, disability and even death. Problems like metabolic diseases, joint and skeletal problems, cardio-vascular diseases, hypertension, obesity, diabetes and so on, can be caused by an unhealthy lifestyle. WHO estimated that 61 per cent of all deaths – 35 million – and 49 per cent of the global burden of disease were attributable to chronic diseases in 2005. By 2030, the proportion of total global deaths due to chronic diseases is expected to increase to 70 per cent and the global burden of disease to 56 per cent. Health risk behaviors are unhealthy behaviors you can change. Four of these health risk behaviors—lack of exercise or physical activity, poor nutrition, tobacco use, and drinking too much alcohol—cause much of the illness, suffering, and early death related to chronic diseases and conditions. Four lifestyle factors – maintaining a healthy weight, exercising regularly, following a healthy diet, and not smoking seem to be associated with as much as an 80 per cent reduction in the risk of developing the most common and deadly chronic diseases. A 2009 study of 23,153 adults who took part in the European Prospective Investigation into Cancer and Nutrition. Volunteers who followed four tenets of good health — they didn’t smoke or get fat; they exercised and ate a healthy diet — were 80% less likely to develop chronic illnesses such as type 2 diabetes, cancer, and heart disease. Their risk of developing type 2 diabetes was 92% lower than the risk of people who shunned the familiar health advice. Their odds of having a heart attack were 81% lower. Surely you don’t need any more motivation to begin implementing healthy lifestyle habits. What I find frightening is that despite the benefits of a healthy lifestyle, only a small proportion of adults actually have a healthy lifestyle. If you are someone who currently doesn’t have a healthy lifestyle let me clarify the fact that changing your lifestyle is an important factor in reducing the risk of lifestyle related disease. Even small adjustments to lifestyle behaviors are likely to have a considerable positive impact. Physical activity, cessation of tobacco consumption, eating a high-fibre, low-fat diet, controlling body weight, getting 8 hours of sleep, having a positive attitude and learning to cope with stress reduce the risk of cardiovascular disease, cancer, and premature mortality. What this means is disease prevention lies in your own hands. Making healthy daily choices in terms of a healthy lifestyle can help to prevent lifestyle related disease such as diabetes, heart disease and stroke. Do you really want to get to the point late in life where you look back in regret at not doing things you know you should have done like choosing better health behaviors and adopting a healthier lifestyle. So, what are you waiting for? Make the changes necessary to work toward the significant benefits of a healthy lifestyle before you experience lifestyle related disease. Are you beginning to see that now’s the time to adopt a healthier lifestyle?